The question is not what you are looking at - but how you look & whether you see. Henry David Thoreau. A year in Thoreau's Journal 1851. Penguin Books 1993. My efforts are directed not to making a carpenter an artist, but to making him happier as a carpenter. Report, Proceedings and Minutes of Evidence of the Royal Commission of 1857 on the Site for the National Gallery . Vol. XIII p. 553. Ruskin believed that drawing, and in particular the purposeful observation required to create a drawing, was the best way he knew of teaching people to see what was in front of their eyes. The presentation in The Elements of Drawing uses drawing as the framework within which the reader will learn how to observe nature. The book is still in print after more than 150 years and although we live in a completely different age perhaps Ruskin still has something relevant to say about observation. My motivation for writing Intense Seeing is far less grandiose than Ruskin's, but it is not dissimilar. Professional scientists and artists undergo long periods of intense specialised study and on-the-job training to achieve the levels of observational acuity required for their success. This book cannot hope to replace that study or experience, but by outlining and illustrating for the lay reader how observational acuity works in practice in the sciences and applied arts it perhaps can highlight how important acuity is for artists and scientists. Perhaps the book can help the average reader become more aware of the elements of acuity and help make them happier as a consequence. 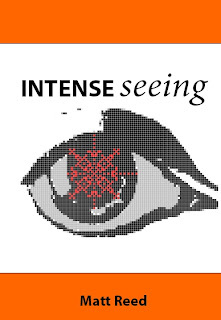 The phrases intense seeing and wide-eyed observing in particular resonated within me; these were great descriptions of what I had been trying to do in my professional work for years, this is what I thought imaging science was about and what I guessed art was also about. If Edward Tufte was correct, that artists and scientists share something in common in the manner in which wide-eyed observing is used, then it must also be true that some components of their training and practice would be common and also some common principles of intense seeing could be described and illustrated by examples from art and science. This hunch has been the motivational force behind collecting the principles and examples that make up the book. The collection of material has therefore come together by a process of accretion - it records a very personal exploration of what intense seeing means, what it requires and what it is capable of. My exploration has resulted in a collection of chapters that are, to my mind at least, thematically coherent -- they were created expressly to address and explore the idea of intense seeing . But given the length and nature of this book, I do not expect many readers will begin at the beginning and work their way through all of the chapters in order to the end. I would encourage readers to read the individual chapters that most interest them - I have tried to make sure that the chapters are independent enough that they can each be read and studied individually. In many of the chapters I take a rather oblique view on my subject matter and try and tie together historical material with modern practice in a way that I hope illuminates and entertains. But these chapters are not entries in an encyclopedia and I do not pretend that they are full historical studies. Visual thinking has consistently driven my curiosity over the past 25 years - in particular quantitative scientific imaging and visual analytics. Both of these are intensely visual . My scientific work has been focused on the interesting technical issues that arise when images are used as the basis for quantification. Initially, I was wholly concerned with the processing and analysis of two-dimensional images. Latterly, I have specialised in the analysis of the two-dimensional images that are obtained when a three-dimensional biological structure is sectioned; a field of measurement science known as stereology (the word Stereology was coined in 1961 by a cross-disciplinary group of scientists -- they defined it as `the spatial interpretation of sections'). My interest in quantitative 3D imaging has also led me to study a number of specialised microscopy techniques that are used to obtain fully three-dimensional images; for example confocal and two-photon microscopy. Running parallel to my scientific studies in image analysis, stereology and three-dimensional microscopy, has been a growing desire to learn how to communicate scientific results in an optimal manner. The main stimulus and guide to my study of scientific data visualisation and presentation has been the series of four self-published books by Edward Tufte; The Visual Display of Quantitative Information [2nd Edition 2001], Envisioning Information [4th Edition 1990], Visual Explanations  and Beautiful Evidence . I first picked up The Visual Display of Quantitative Information in about 1997 and I have returned to it, and the other three books by Tufte, to read and re-read ever since. These two concerns provide the thematic underpinnings of much of my published scientific work and the lecture material I have developed over the years. Now both of these threads come together in this book - it is a scientific and visual record of the journey I took to explore the intense seeing hypothesis. Prior to writing this book I spent time teaching myself how to use the LaTeX typesetting system created by Donald Knuth and Leslie Lamport. In the process of teaching myself LaTeX I also learnt a lot about the ancient art and craft of typography. Robert Bringhurst describes typography as, `...an art where the microscopic and macroscopic constantly converge' (see his book, The Elements of Typographic Style). This software has allowed me to take complete control of the design and typesetting of the book and I have designed the page layout so that the main body of the text, with the main figures and images, can be read straight through -- the mathematical and technical material included in the main text has been minimised and my target was zero equations. The page layout from The Feynman Lectures on Physics by Richard Feynman, Robert Leighton, and Matthew Sands has been a guiding example of what I wanted to achieve. The sidenotes are provided to give interesting technical details to those who appreciate them, they also indicate my sources and show where additional reference material and website links can be found. The side notes also occasionally include good examples or images that would otherwise break the flow of the main text. Therefore on the whole the side notes can be blithely ignored by most readers (an avid scholar of intense seeing will be kept busy for quite some time following up on them). Because I have written, designed and typeset the book literally all of the mistakes are my own. A full list of acknowledgements is given on page 300. I hope that you enjoy reading this book as much as I have writing it.